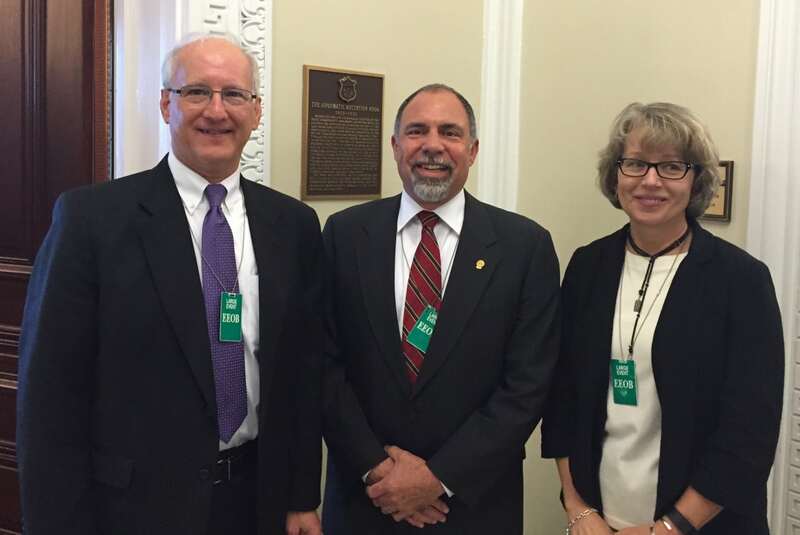 (ARLINGTON, VA.) — David Callis, executive vice president and general manager of TECA, was joined by Appalachian Electric Cooperative Manager Greg Williams and North Georgia Electric Membership Corporation Manager Katheryn West today in a meeting with White House officials in Washington, D.C., to discuss recent progress and potential collaboration on efficiency and renewable energy development. The Tennessee co-ops were among 30 cooperatives invited to attend the meeting with officials from the White House Rural Council and the USDA’s Rural Utilities Service. “We had a productive conversation about how we can build the value of current federal programs and find more opportunities to bring the benefits of new efficiency and renewable energy technologies to our members,” said Callis. Nationwide co-ops have been rapidly adding renewable energy capacity to the rural electric grid. The nation’s more than 900 co-ops own or purchase about 16.5 gigawatts of renewable capacity and plan to add 2 GW of capacity in the near future. Cooperatives lead the nation in the development of community solar energy. In addition to renewable energy development, co-ops are pursuing energy efficiency programs and innovations to help members reduce their bills. TECA is working with its member co-ops to develop a loan program to assist low-income homeowners with efficiency improvements. Tennessee co-ops view efficiency as a key component in a broader strategy to meet the challenges of growing electricity demand and rising costs.